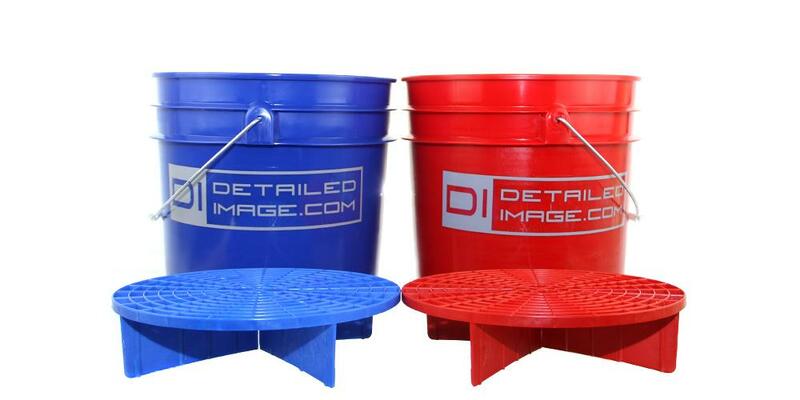 We have hand picked each item in the 2x 3.5 Gallon Buckets & 2x Grit Guards Kit because they are highly effective when paired together. To create the best kit possible we utilize our years of detailing experience, combined with input from some of the best detailers around the country. We are confident you will get outstanding results with each item and really enjoy how your vehicle looks afterward. Save $11.95 off of the retail price of individually purchasing these items! DI Accessories Rinse Bucket Sticker (Grey) - label your Rinse bucket with a beautiful DI sticker! DI Accessories Wash Bucket Sticker (Grey) - label your Wash bucket with a beautiful DI sticker! Fantastic! I like the 3.5 gallon size and the two different colors so that I can easily remember which is the rinse water. Grit guards are a must, of course. They stack together even with the grit guards inside and make storing on the garage shelf easy. Wonderful package! An excellent kit. Wish there was a black 3.5gal bucket addition for wheels, but that can be added separately. Awesome store, great prices and shipping was stupid fast. Appreciate it!